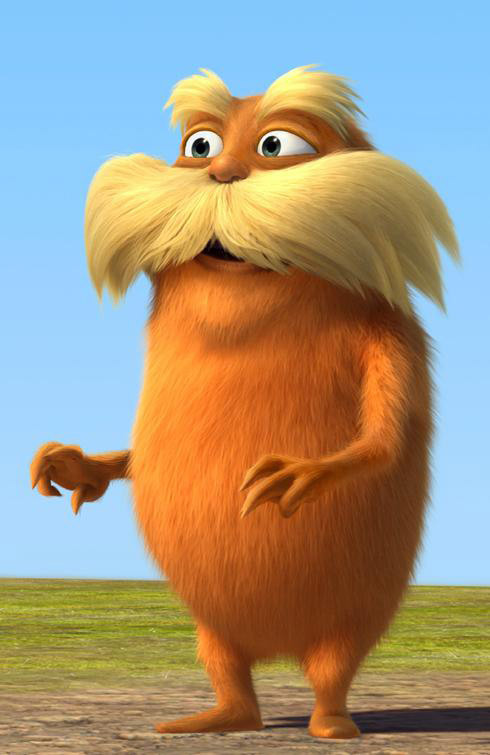 Here's your first look at the 3D film adaptation of Dr. Seuss' The Lorax. This film comes from the same team that developed Despicable Me and Horton Hears a Who. The image above comes from USA Today which also reveals that Danny Devito will do the voice for The Loraz in the film. The villains in the story will be voiced by Ed Helms (The Office) who will play The Once-ler, "a shortsighted, greedy creature who chops down every tree he can find to make his Thneeds, which are 'a thing everyone needs,'" and Rob Riggle (The Hangover) will be a new character called O'Hare, "another industrialist who sells cans of fresh air to the polluted world the Once-ler creates and wants to keep it that way." The newspaper says the movie will start much like the 1971 book, with Zac Efron voicing a boy named Ted, "who goes in search of the Once-ler to find out how the world became so ugly." Betty White will play Ted's grandmother, "who tells him of the colorful world that used to be." Another new character is the girl Ted loves, Audrey. The movie will be released by Universal Pictures on March 2nd 2012.